To facilitate the installation of Unisteer's Power Rack & Pinion kit in for '67-'69 Firebird and '68-'74 Novas. This U-Joint kit is to be used in these vehicles that are using big block engines or abnormally large headers. 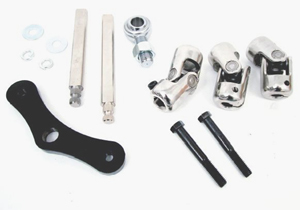 The kit consist of three U-Joints, two sections of 3/4" round shaft, and a support bearing. The first U-Joint goes from the power rack & pinion to a 3/4"smooth, the second U-joint is 3/4"smooth on both sides, and the third joint comes in two different options. The first option is for a U-Joint to fit the Factory column, the second option is for a U-Joint with 1"-DD to fit most aftermarket columns. The kit then also includes two sections of 3/4" shaft and a support bearing to be mounted to the frame to support one fo the sections of shaft.